Cream shortening and sugars. Adding egg and vanilla until well combined. In separate bowl, sift flour, salt and soda. Gradually add to sugar mixture. Stir in oats and nuts. Shape in long log roll, wrap in wax paper and chill. Slice 1/4 inch thick. Bake un-greased cookie sheet 350 degrees for 10 minutes. Makes 5 dozen. Recipe from 1953 Better Homes and Gardens Cookbook. I found the recipe over at allrecipes.com. Place ingredients in the pan of the bread machine in the order recommended by the manufacturer. My order is as follows: milk, eggs, butter, sugar, flour, salt and yeast. Press dough cycle and start. Original recipe posted on AllRecipes.com, Clone of a Cinnabon. Boil potatoes until a fork can easily be inserted. Cool, peel and cut in small cubes. In large bowl add potatoes, celery and scallions. Set aside. Peel 3 boiled eggs and cut in small pieces. Add to potatoes, celery and scallions. In separate bowl combine mayo, mustard, worcestershire, parsley, garlic powder, season salt and pepper. Mix until smooth. This is the part that you will need to add more seasonings, if needed. If your mixture is too salty, add more mustard and mayo and so on. When you get the mix just right, start adding a little at a time to the potato mixture. Stir until you get a nice consistency that's right for you. Slice 3 eggs for decoration. 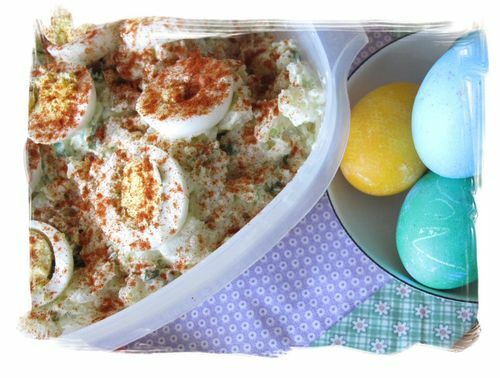 Place over potato salad and sprinkle with paprika. Chill for 3 hours before serving. 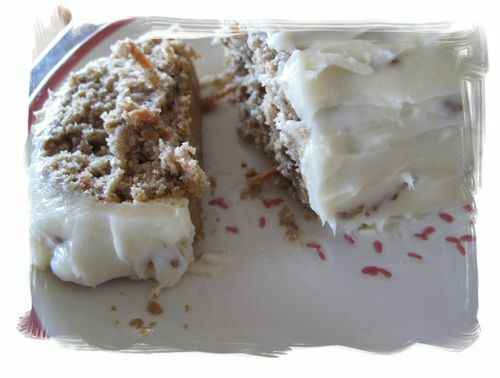 This is a great little recipe my husband got from our friend Pam. Thanks for the recipe :) Enjoy! Tear angel food cake in pieces and place around bundt pan. 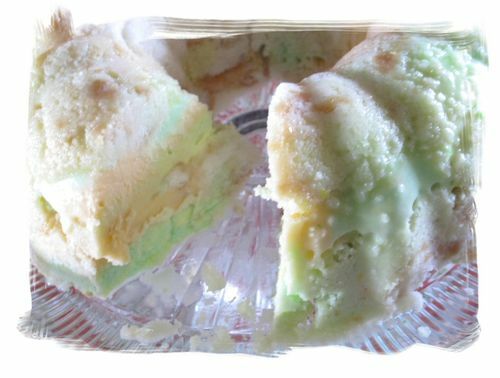 For the second layer, use an ice cream scoop and scoop rainbow sherbet on top of cake and all around. Keep repeating layers and pressing down with each new addition. I actually used a white cake mix from a box. I'm not a huge fan of the "angel food cake", so whatever you prefer. Dan said it's great both way. When you reach the top of your bundt pan, smooth all the way around with a rubber spatula and wrap tight in foil. Freeze overnight or for at least 4 hours. Fill your sink with hot water, and dunk the bottom of the bundt pan in hot water for 30 seconds or so. Invert on cake plate, it should come out easily, if not repeat process. I love this recipe! My good blogging buddy Theresa posted this on her blog last Spring, it's so good! To prepare bread, lightly spoon flours into dry measuring cups; level with a knife. 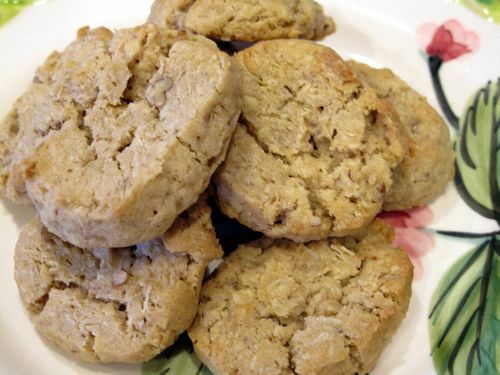 Combine flours, oats, cinnamon, baking powder, baking soda, and salt. Place brown sugar and butter in a large bowl; beat with a mixer at medium speed until well blended. Add water and egg; beat well. Beat in milk and vanilla. Gradually add flour mixture, stirring just until blended. Fold in carrot and raisins. Spoon batter into a 9 x 5-inch loaf pan coated with cooking spray. Bake at 350° for 1 hour or until a wooden pick inserted in center comes out clean. Cool in pan 10 minutes on a wire rack; remove from pan. Cool completely on wire rack. To prepare frosting, place cream cheese and powdered sugar in a bowl; beat with a mixer at medium speed until fluffy. Beat in lemon juice. Spread frosting over top of cooled bread.